Drop the dice and spice up your Settler's of Catan or Cities and Knights games with this new set of cards. 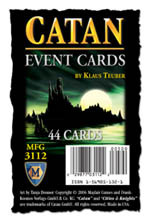 The Catan Event Cards feature thirty-six cards that act as a deck of dice, replacing the need for dice in your Catan game. Special events are triggered by these cards each time they are turned over, adding an exciting new element to your Catan play. Also included are 6 score keeping cards, the rules card, and a reshuffle card. We aren't huge fans of the event cards... we like rolling the dice more than drawing cards. Does intensify the game in some good ways, however. Fun to have as an option for play. By adding this deck of event cards you take away the luck of the dice roles and you add a few fun events in a long the way. Drawing the card and possibly taking an action along with collect that numbers resource this is a fun change of pace.